The problem with exchange is that all members of a Distribution Group need to be either a mail contact or a user account (Either static or dynamically assigned). That’s a lot of administrative over head when it comes to emails that just get pumped out to hundreds or even thousands of people. On top of that all these contacts and groups start to clutter up your AD and Address Book in Exchange. My of my users hate seeing them in there and moan quite a bit about it. Well there is 2 of them. Lets take a look at them and I’ll show you how I managed to deal with this. Here we place a server in front of exchange that sorts mail before sending it to exchange. The drawback here is, if you have already got an Exchange environment it requires quite a bit of configuration to change it. Although that’s not to say i would never use this configuration. Infact it would be a great idea if you handled multiple domains. This would be another good place to scan mail as all mail has to pass though it to get in. See the diagram below. Here we bolt (as it were) the Mailing list server. The benefit here is that we can do all the configuration without the need for downtime. However there is a drawback, You will need 1 distribution group in exchange for every group you create as well as 1 Mail contract that will be a member of that group. Still 2 objects is better than creating 100 objects ? This however can also be a good thing as the group will show up in the OAB in exchange if you choose not to hid it. This is the option I have chosen. Take a look at the diagram below. I had a limitation placed on me while doing this project. THE SOLUTION HAD TO RUN ON WINDOWS! and require as lest cost as possible (This mean it needs to be free). This closed off all open source options and narrowed down the list. I found 2 options but only 1 stood the tests. This is a great lightweight mail application that supports pop and imap (As well as groups). It however failed in that it needed some VB Scripts to add the group members into its DB. These guys offer a solution that rivals Exchange in terms of features. The standard edition is free and paid for version looks like its well worth the money. Amongst its myriad of features is the support for Email Lists and Group. THEY HAD A BUTTON AND I TOOK IT! Firstly we need a server to run EnableMail on. It looks like a lot but really it’s just .net 3.5, IIS 6 Management console and telnet client. You will also need to give your machine a static IP address. Next download the EnableMail Server binaries. http://www.mailenable.com/download.asp Use this link to get to the download page. The install is very straight forward and doesn’t ask any questions that you shouldn’t already know the answer to. When it asks you for a post office account this will be your domain name (Or descriptive). When it asks you for the first domain, this will be the domain that your groups will use. Lets see the few changed to you need to make after the install. First get the console open. Now we need to sort out the SMTP Settings first. You can change the settings as you need to. This is what I changed. Set the exchange server that will be receiving email from this server and authentication if needed. Now apply all those settings. While we are here lets create our first group. I’ll leave it to you to see which one will be better for you. Lists – Emails come from the list server. Groups – Emails come from the user that sent the email to the group. And that’s that! Enable Mail should now be ready to start pumping out mail. Create a Accepted domain and make it a internal relay. Create a receive connector on a server using port 26 and anonymous authentication and permitted source. Organization Configuration > Hub transport > Send Connectors > Create a new send connector. Apply the settings. You may need to wait for replication if you have multiple Exchange servers. The receive connector is more of a personal preference. In my case, my external mail scanners wont accept email from anyone other than my exchange servers that I have authorized. So I rather decided to inject the email back into the exchange environment and let it deal with delivery. If you can send mail straight out I would suggest making EnableMail just send out. If you cant and your like me, here’s what I did. Add a listening IP and assign port 26 to it, then remove the default created one. Now open the newly created receive connector and select Permission Group. Make sure that only the “Anonymous Users” is ticked. Apply and OK. The reason that we need to allow Anonymous users is so that exchange will accept email on this connector that is destined for mail domains that are outside of the exchange organization. This part you will need to do for each and every group that you create. 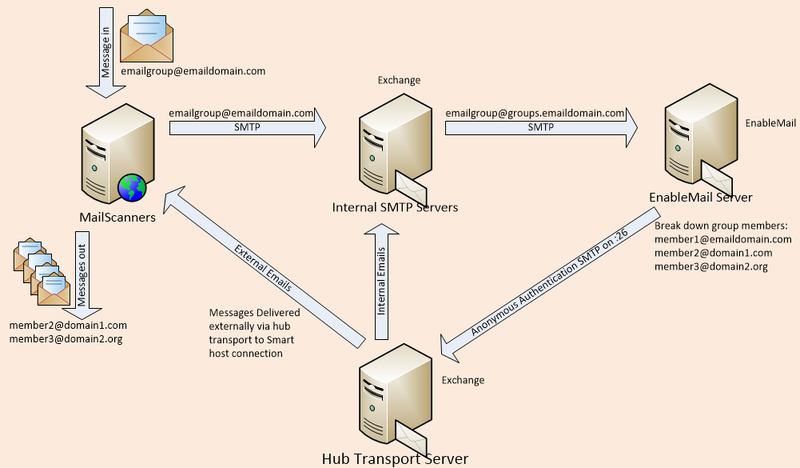 Make a mail contact that has the external smtp attribute set to the email address of the group that we created. ( above we created group1@groups.maildomain.com). Now create a distribution group with the email address that you want people to use. eg. group1@maildomail.com and add the above created mail contact as a member. This will then forward the emails to your EnableMail group which then gets broken down to members and sent out. Once you have added the mail contact to the group it may be a good idea hide the contact from the address book settings. By using the distribution group you effectively hide the EnableMail server from your users. They should see the email address as group1@maildomain.com when they send to it and reply to it. That should be that. Its a long and bumpy road to get here but I hope it works for you. I hope that this helps someone out there.